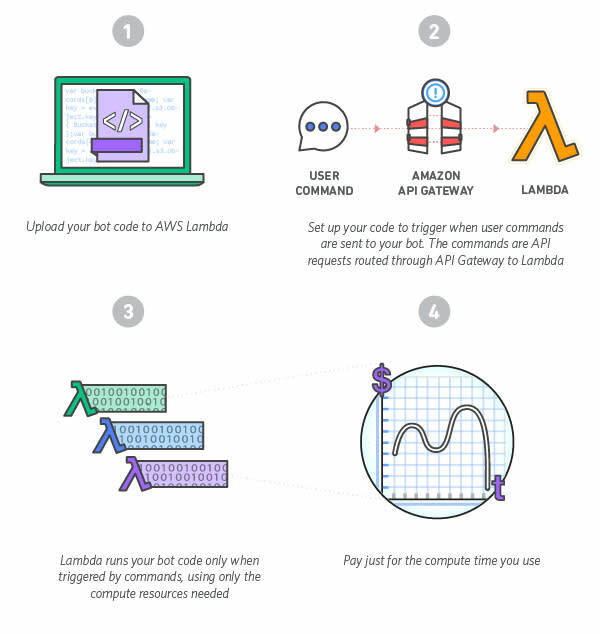 Easily build scalable bots for Slack using AWS Lambda – all without needing to provision and manage servers. Bots on Slack can help your team be more productive and accomplish more tasks. They can help you increase visibility into your operations or help your customers easily get information through a natural, conversational interface. However, building and running bots can be a time consuming and difficult task. Developers must provision, manage, and scale the compute resources that run the bot’s code. Wouldn’t it be nice if you could focus on building great bots without worrying about how to run and scale them? AWS Lambda is a service that lets you run code without provisioning or managing servers, and you only pay for the compute time you consume. With Lambda, it’s easy to build and run bots. You just upload your code and Lambda takes care of everything required to run and scale your code with high availability. Start building a bot today. Enter the AWS Serverless Chatbot Competition for a chance to win tickets to AWS re:Invent in Las Vegas. See our sample bot on GitHub for how to get started. *AWS offers a Free Tier for AWS Lambda and Amazon API Gateway. See the FAQ to learn more. Be a working bot for Slack that runs on AWS Lambda. Bots must use AWS Lambda and Amazon API Gateway. See our sample bot code for an example. Be a new or existing bot (If existing, submitters must have updated their bot to run on AWS Lambda during the submission period). Include a link to your bot code on GitHub (this repo may be public or private – if private, access must be given in the testing instructions provided). GitHub code will be used only for bot review and testing. Include all deployment files and testing instructions needed for testing your bot. Register for the AWS Serverless Chatbot Hackathon competition. Create accounts on AWS and Slack. Visit the Resources page for links to documentation and resources for Slack APIs, AWS Lambda, and more. See our sample bot on GitHub for an example of how to build your bot on AWS Lambda. Shoot your demo video that demonstrates your Slack bot in action. Prepare a written summary of your bot and what it does. Submit your bot on AWSChatbot.Devpost.com before September 29, 2016 at 5pm ET and share your Github repo and deployment files. The extent to which the bot provides value to Slack users. Does your bot help solve a problem or painpoint for your users? Creativity and originality of the bot idea. Is your bot differentiated or does it solve your users' problems in a unique way? How well the bot idea was executed by the developer. Is the bot technically sound and does it function as intended?